At St. John Fisher, we believe in the value of sport. P.E. is an integral part of our curriculum, we have numerous school sports clubs such as Tennis, football, athletics, Gaelic football, Gymnastics, dance and netball. We have sports days for KS1 and KS2, and an interhouse sports between our houses in team sports. It is important that children have some physical activity each day if possible. All of our classes have two sessions of P.E. each week. We follow the Val Sabin programme for PE and cover all areas of the PE national curriculum. All KS2 children get the opportunity to swim each term too. There is a wide selection of extracurricular clubs for children to take part in. Class teachers and outside agencies provide a variety of afterschool sessions targetting different age groups throughout the school. We are commited to entering external competitions whenever possible and love the opportunity to report back to the rest of SJF during our 'Good Work Assembly' every Friday. Scroll down or follow us on Twitter @StJohnFisherCVA for all our latest sports news and updates! We have a team of very hard working, dedicated pupils who facilitate and run sports competitions and games during playtimes and lunchtimes. Even when it's pouring with rain our sports crew still manage to keep children active inside with great games and activities. In our gallery below you will see some of the activities that we have organised so far. Keep an eye on our Twitter account for all of the latest sporting updates! Yet again, we will be competing in numerous competitions this term. Have a look through the slideshows below to see what we have been up to so far this year. What a day! Here we are competing at the Saffron Lane Area Sports. We couldn't be prouder of our students at SJF, after a full day outside in the torrential rain and cold weather, there were still lots of smiling faces! Excellent behaviour, overwhelming support and outstanding results achieved by all! A huge well done! We have had a hugely busy Spring term, getting involved in lots of sporting competitions! We have participated in the Football league, Gymnastics, Cross Country, Tennis and before the end of term, Netball too! As always, we have had some fantastic results and should feel very proud of ourselves. Watch this space for pictures and reports of these events coming soon! What a fantastic term for our Football team. We are the S.E division group WINNERS! A huge thank you to Leicester Schools FA and Mr Gallagher too. Following our well earned first place at the Sportshall Athletics, we were then invited to Loughborough University on the 1st December, to compete in the Leicestershire and Rutland County Finals! Our dedication and effort for both of these events was fantastic and we loved every minute. We even got to meet the Under 17's Cross County GB Champion Issac Aikers. The pupils were VERY impressed with their signatures! During the Autumn term, each of our year groups from Yr2 to Yr6 were given the opportunity to compete at the Goals tournament! This is organised by Miss Pinel and students from St Paul's school. Both Year 2 and Year 6 returned with an incredible 1st place, whilst it was a fantastic 2nd place in Year 5. Well done to all! On the 27th October, some of our Year 5's and 6's took part in the Sportshall Athletics and came FIRST! As a result, are now invited to take part in the Leicestershire and Rutland Level 3 Finals on the 1st December. We even won the 'Spirit of the Games' award for our 'excellent sportsmanship, determination and passion' at the events. Well done SJF!!! Year 1 are very lucky to be having 'balanceability' sessions with Ms. Pinel from St. Paul's. They are working on improving their balance and co-ordination and even learning ride a two wheel bike! As you can see from the photographs the children love these sessions. Thank you Ms. Pinel! Year 1 and 2 recently took part in a sports festival at Aylestone Leisure centre. This was organised and led by pupils from St Paul's. A great time was had by all! SJF entered a cross country team in a city festival at Knighton park on Friday 9th October. The team did magnificently well and ran their socks off. After a record number of matches for the school team in autumn and spring, SJF qualified for the finals day competition at Leicester City’s 3G training ground. Nine teams from around the city qualified too so the standard of competition was high. We were assigned into group B with 4 other teams and after some very tight matches, SJF came 2nd in their group with 3 wins and 1 defeat. This meant we had to play the winners of group A, Inglehurst, in the semi final. Yet again, another close match ensued. It was a scoreless draw at the end of normal time but in the dying seconds of extra time, after a goalmouth scramble, Inglehurst got the decisive goal to go through to the final and eventually win it. Well done to the team who represented their school so well throughout the day; Charlie Botte, Finn Reilly, Ben Radburn, Junior Makombe, Kian Stanley, Ashay Khakhar (c ), Henry Zubryckywj, Thomas Whelan and Michael Donaghey. Many thanks to all parents who have supported the team loyally throughout the year. Many thanks too to Mr Stevens for his coaching at football club. On Wednesday we attended Saffron Lane for the East Primary Athletics day. All of the children who attended were fantastic and the behaviour and attitude displayed by them was brilliant. It was a very proud day for St John Fisher. Everyone who took part gave 100% and we managed to come back with some medals! Some of the results have not yet been published but we will inform children when we get them. Many thanks to all the parents for their great support! Well done again to all who took part, you were outstanding! Fantastic performance at Goals by the year five children! It was such a rainy day, you all did so well! Well done to the tennis players that attended the competition! You all played brilliantly! Well done girls! You were fantastic! The school tag rugby team played in a city schools tournament on Friday, April 24th. We were representing New Zealand in the tournament. More photos on the Leicester Mercury website. Congratulations to Claire Keogh who has won the County Junior Girls Order of Merit for 2014 for Kibworth Golf Club. Claire is a past pupil of SJF, now studying at St Paul’s. The school football team has qualified for the schools football finals day in May. We had a brilliant spring term in relation to sports and it is only going to get better! The football team have been superb! They were absolutely fantastic and came second overall in the league, well done to everyone that took part in the matches; you made us all really proud! The High 5 team had two evenings of matches where they played against different schools. They did a brilliant job and played really well against all the other schools. Well done team SJF. The clubs have now changed over and there is no longer High 5 or football club, instead we have Kwik cricket and athletics. 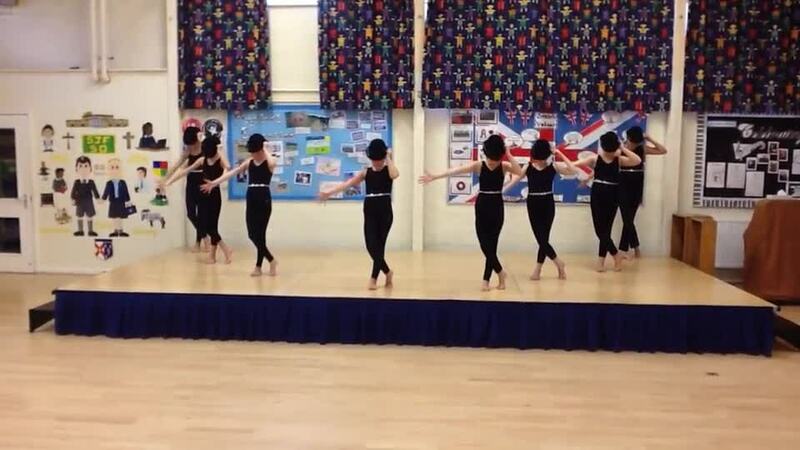 Seven girls attended the gymnastics competition at Fullhurst Community College in the spring term and were wonderful! One of the teams has made it to the next stage and is in with a chance of representing SJF at the School Games in June. Good luck girls! Keys steps 2: Came third overall and were the East Leicester winners and will go onto the next round. Key Steps 3: Came 2nd overall. The team that came first were also from East Leicester so the other team go through to the next round. The keys steps three team only had three members in their team and still accumulated enough points to come second overall even though other schools had four members. An outstanding achievement girls! Mr Gowan, a sports coach from GSD15, has been coming in to work with year five and six and will continue to do so next term. They have been working on TAG rugby and will be moving onto Athletics in the summer term. This term is going to be a super term in relation to sports! We have the Top Link festivals for years three, four, five and six at St Paul’s with other trust schools. Let’s try and come back with a trophy or two! There is a TAG Rugby tournament that the year six children will attend in April. We have adopted New Zealand as our country to represent at the tournament and are very much looking forward to having a go at the HAKA! Remember the Rugby World Cup is starting in September this year. If you would like to find out more about Rugby clubs in your area, don’t forget to ask Miss Devlin. A Kwick Cricket tournament will be held for the year five children to attend and we also have the mini tennis tournament coming up in May. A coach from Leicester City has started sessions in year one and will move on to year two children next half term. The coach will be staying to run an after school club for some children in years three and four. The year six children have the swimming gala at Oadby swimming pool where a team will represent SJF against other schools in our trust. Good luck swimmers! Miss Pinnel from St Paul’s has started some athletics coaching in year four. We have the Area Sports competition at Saffron Lane in June where children from years four, five and six will represent SJF in different activities. Good luck to all that attend! Finally we will have the St John Fisher sports days in key stage one and key stage two along with our annual inter- house sports day. These events are always fun and enjoyable and we are really looking forward to them this term. Have a fantastic term and remember to let us know how you are leading a healthy and active lifestyle and if you have any pictures or certificates that you would like to share with us we might be able to display them! The school football team are on a bit of a rollercoaster at the moment. Wins followed by defeats and then draws. And then wins. You get the picture. For example, today (13/11/14) at Aylestone leisure centre, the team lost its first game 0-3, won its second 3-0 and drew its third 0-0. Symmetry in motion. A big plus today was our new kit, kindly donated by Saffron Dynamo football club. Don't they look smart!